At first glance they might look like… hey, they are boobies! 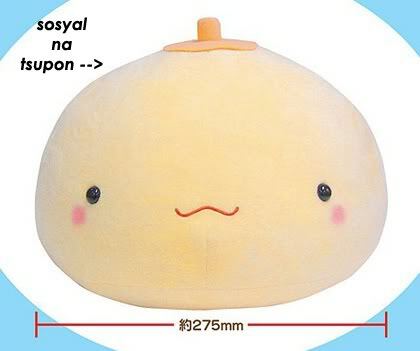 Cute boobie plushies in fact. 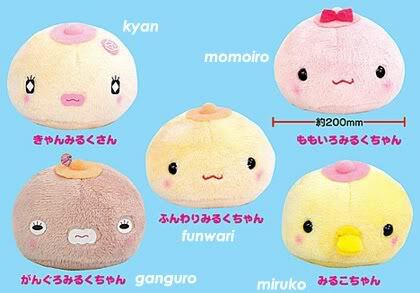 From the kyara goods maker, JUN Planning, comes another plushie collection called Funwari Miruku-chan (funwari = fluffy and miruku= milk). Like the Cabbage Patch Kids of years yonder, these slightly mischievous plushies have a background story and kyaras to match. Kyan Miruku-san: Celebrity and idol, always a-glitter, has an American boyfriend. Hobby: Getting beauty treatments. Miruko-chan: The baby among the bunch but a genius (the secret of which is her pacifier). Hobby: Inventing things. Info and photo from the Funwarimiruku-chan Official Website. I should give one to my funwari-kun. 😀 Heeeee….